In 4-quart Dutch oven, cook linguine as directed on package. Drain; return to Dutch oven and cover to keep warm. Meanwhile, in 10-inch nonstick skillet, melt butter with oil over medium heat. Add garlic; cook and stir 1 minute. Add bell pepper, onions, parsley and flour; cook and stir 1 minute. Gradually stir in milk until well blended. Heat to boiling, stirring constantly. Cook 6 to 10 minutes, stirring frequently, until sauce is bubbly and thickened. Remove skillet from heat. Stir in basil, oregano and salt. Pour sauce over linguine; toss gently to coat. Sprinkle with cheese. 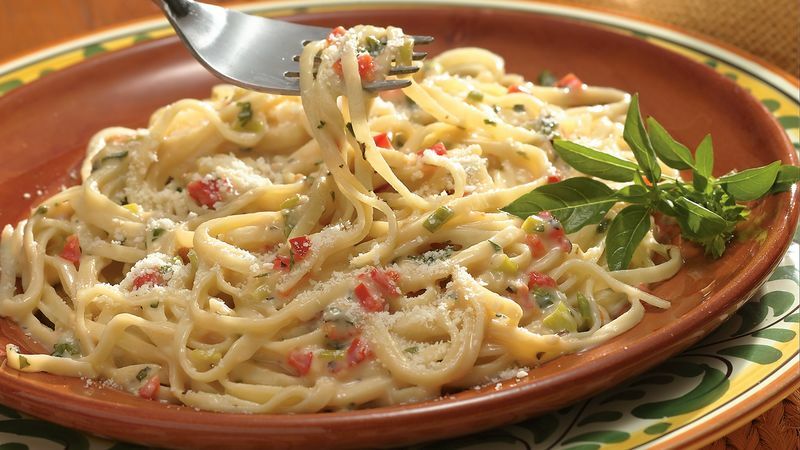 Linguine are long, narrow, flat noodles and are perfect with this creamy sauce. However, if you prefer, you could substitute spaghetti or angel hair pasta.